Leroy Mendoza, 12, plays baseball with his friends in San Agustin neighborhood, in Caracas, Venezuela, Sunday, Feb. 3, 2019. More than a billion people worldwide celebrated the Lunar New Year this week. From new year celebrations to protests, this week was one of both happiness and sorrow. These powerful photos capture the festivities of some and the struggles of others as the world continues to deal with a global migration crisis and the impacts of climate change, showing why support for the Global Goals is as urgent as ever. You can join us in taking action here. This week marked the start of the Lunar New Year, celebrated globally by Chinese, Vietnamese, South Korean, and other Asian communities. 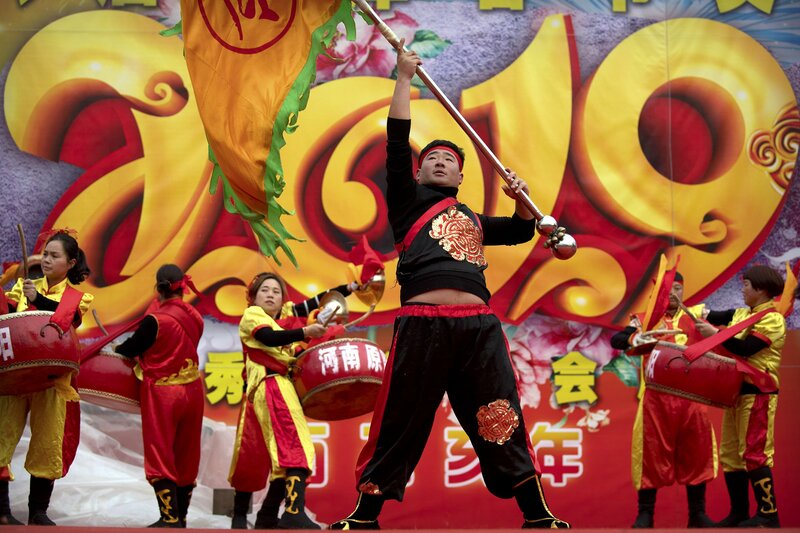 Chinese people everywhere rang in the "Year of the Pig" with vibrant celebrations, dances, and firework displays, hoping for an auspicious year. In India and across Europe people demonstrated their wishes for a bright year and future ahead a little differently — through marches. India hosted its first Pride marches since the country decriminalized homosexuality last September. And in the Netherlands and Belgium, students took to the streets to call for climate action. But as many around the world partook in festivities, others struggled to survive under harsh conditions. Despite efforts to return hundreds of thousands of Rohingya refugees to Myanmar, the UN says conditions are not ready for their return home. A visit from UN special envoy Angelina Jolie highlighted the need for more humanitarian aid in Bangladesh's refugee camps. And even as the US remains divided over immigration policies, Central American migrants, desperate to find relief from rampant gang violence and extreme poverty, continue marching north. These stunning images show this week's most inspiring highs and heart-breaking lows. 1) Lunar New Year: Drummers perform in front of a mural reading "2019" at a temple fair at Longtan Park in Beijing, Feb. 6, 2019. Chinese people celebrated the second day of the Lunar New Year on Tuesday, the Year of the Pig on the Chinese zodiac. Environmental advocates took this opportunity to urge people to eat less pork and help save the planet. China consumes more meat than any other country and accounts for half the world's consumption of pork. This has helped make it the world's biggest emitter of climate-warming greenhouse gases — according to the UN Food and Agriculture Organization (FAO), livestock are responsible for about 14.5% of global emissions. China issued dietary guidelines in 2016 recommending people halve their meat consumption — a move lauded by environmentalists as a way to cut greenhouse gas emissions as well as boosting public health. 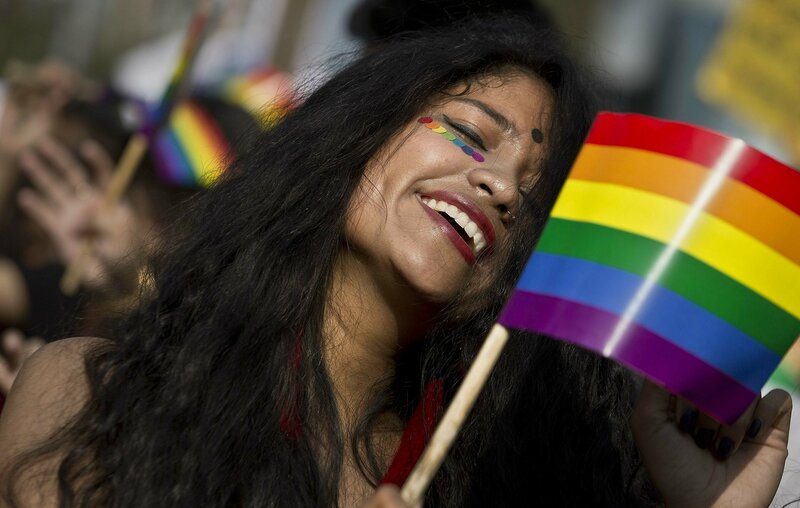 2) Pride in India: A participant waves a rainbow flag as supporters of the lesbian, gay, bisexual, and transgender community participate in a pride parade in Gauhati, India on Feb. 3, 2019. Homosexuality has gained a degree of acceptance in deeply conservative India over the past decade, particularly in big cities. Last year, India's top court struck down a colonial-era law that made homosexual acts punishable by up to 10 years in prison. The court gave its ruling on a petition filed by five people who challenged the law, saying they were living in fear of being harassed and prosecuted by police. Health experts are hopeful the ruling will help the fight against HIV/AIDS in the country as stigma attached to the disease lessens. 3) Displaced in Syria: Syrian children queue to receive food distributed by humanitarian aid workers at a makeshift camp for displaced people, near the village of Yazi Bagh, about six kilometres from the Bab al-Salamah border crossing between Syria and Turkey in the north of Aleppo province, on Feb. 7, 2018. 4) Climate Protests in Europe: Dutch students protest for urgent measures to combat climate change in The Hague on Feb. 7, 2019. The huge student protest movement sweeping across Europe hopes to push authorities into providing better protection for the world's climate. 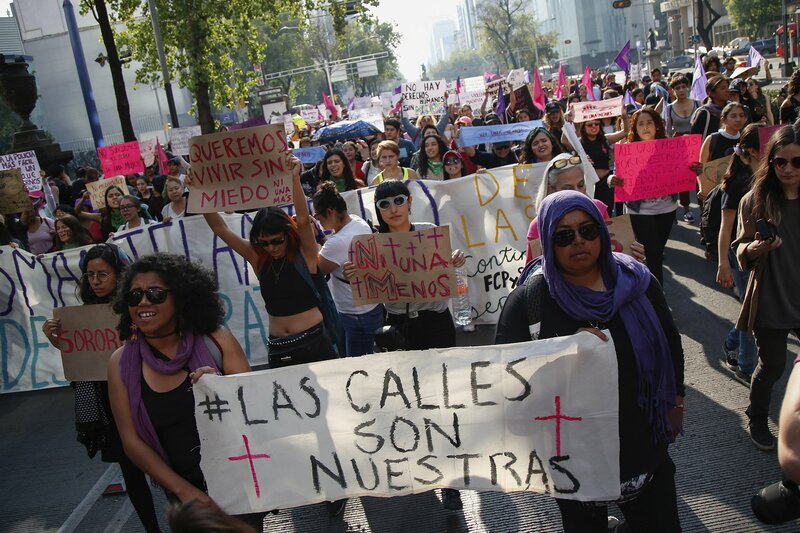 5) Violence Against Women in Mexico: Protestors hold signs that read, bottom, "The streets are ours", center, "Not one more", and top, "We want to live without fear," during a protest in Mexico City on Feb. 2, 2019. Demonstrators marched in the streets to raise awareness against kidnappings and killings of women, after a recent spate of denunciations by women on social media about alleged kidnapping attempts in subway stations. 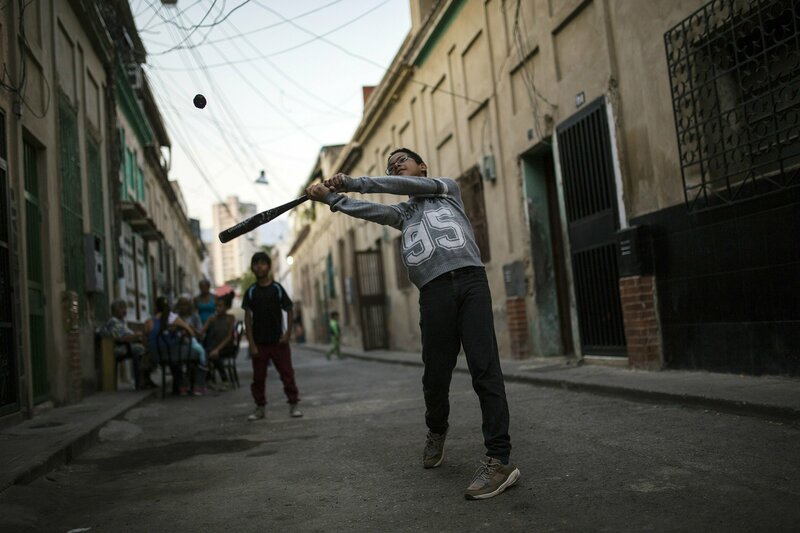 6) Daily Life in Venezuela: Leroy Mendoza, 12, plays baseball with his friends in San Agustin neighborhood, in Caracas, Venezuela, Feb. 3, 2019. Nearly 9 in 10 Venezuelans live in poverty — and the country's economy has tanked so extensively that the industries that once enabled a broad social safety net have mostly collapsed. The country is currently in the midst of serious economic turmoil, with millions of refugees and migrants fleeing to neighboring countries. The exodus from Venezuela has steadily grown over the past few years, following a collapse of the country’s economy, widespread food insecurity, a faltering health care system, and violence. Maduro was in power during this economic collapse, and even though he was re-elected last year, many citizens and global leaders have disputed the election's results and process. 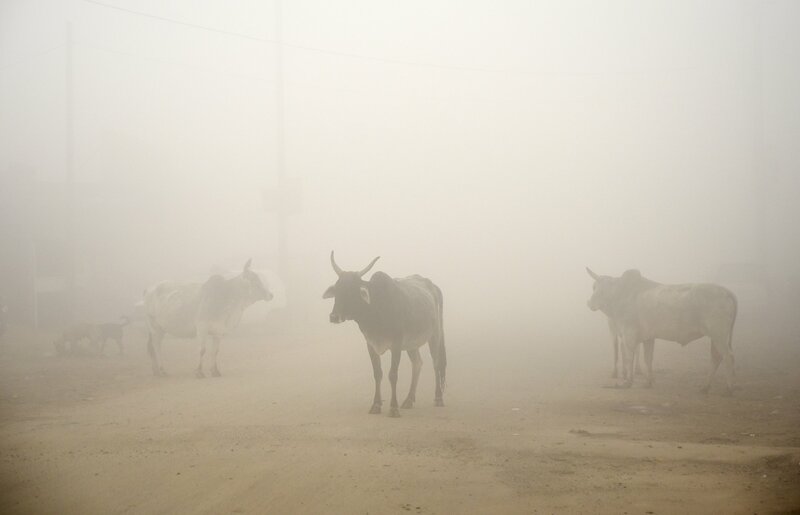 7) Air Quality in India: Cows stand in the middle of a road in the morning fog in Greater Noida, near New Delhi, India, Feb. 4, 2019. During winter, a thick, soupy smog routinely envelops most parts of northern India, caused by dust, the burning of crops, emissions from factories, and the burning of coal and garbage piles as the people living in poverty try to keep warm. 8) Central America Immigration: A Honduran family walks along the banks of the Rio Bravo in Piedras Negras, Coahuila state, Mexico, as they prepare to cross it illegally, after being rejected by US authorities in their attempt to enter Eagle Pass, Texas through the international bridge on Feb. 6, 2019. Around 1,700 migrants traveling by caravan reached the US-Mexican border on Tuesday. Migrants fleeing Central America's Northern Triangle region comprising Honduras, El Salvador, and Guatemala routinely cite poverty and rampant gang violence as their motivation for leaving. 9) Lunar New Year: Dragon dancers perform at a park in Beijing on the fourth day of the Lunar New Year on Feb. 8, 2019. China is marking the arrival of the Year of the Pig with a week-long Spring Festival holiday, the most important festival of the year. 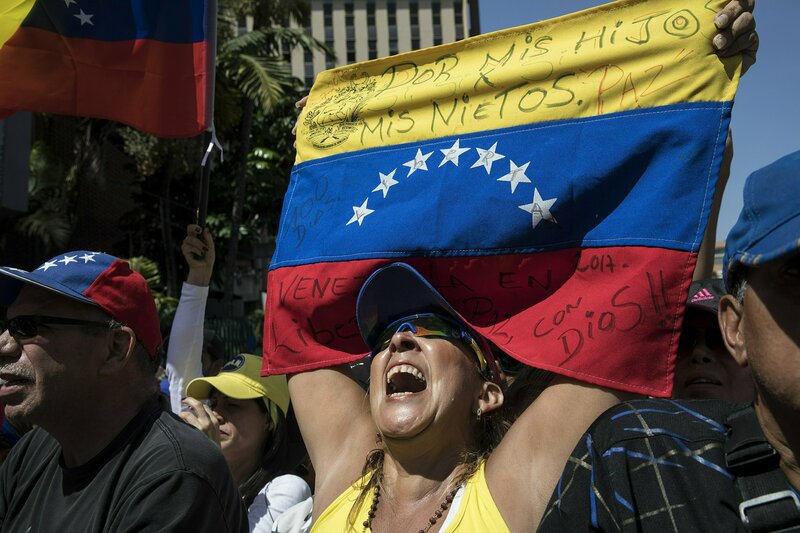 10) Political Crisis in Venezuela: An anti-government protester, holding a Venezuelan national flag with a message that reads in Spanish: "For my children and for my grandchildren" cheers during a demonstration demanding the resignation of President Nicolas Maduro, in Caracas, Venezuela, Feb. 2, 2019. Momentum is growing for Venezuela's opposition movement led by self-declared interim president Juan Guaido, who has called supporters back into the streets for nationwide protests Saturday, escalating pressure on Maduro to step down. Venezuela is currently in the midst of serious economic turmoil with millions of refugees and migrants fleeing to neighboring countries. The exodus from Venezuela has steadily grown over the past few years, following a collapse of the country’s economy, widespread food insecurity, a faltering health care system, and violence. Maduro was in power during this economic collapse and even though he was re-elected last year, many citizens and global leaders have disputed the election's results and process. 11) Angelina Jolie Visits Rohingya Refugees: UNHCR Special Envoy Angelina Jolie speaks with Rohingya refugees in Chakmarkul camp, in Cox's Bazar, Bangladesh on Feb. 4, 2019. “What is most tragic about this situation is that we cannot say we had no warning,” Jolie, a special envoy for the UN Refugee Agency (UNHCR), said on Tuesday. “It is the result of four decades of persecution and discrimination, which have gone unaddressed for far too long.” The actress and superstar humanitarian was in Bangladesh this week as part of a UNHCR mission to assess humanitarian needs in the refugee camps. Hundreds of thousands of Rohingya refugees have been living in camps in Bangladesh since fleeing neighboring Myanmar in droves in August 2017. The Rohingya are a predominantly Muslim, ethnic minority who have been deprived of their rights for generations in Buddhist-majority Myanmar. 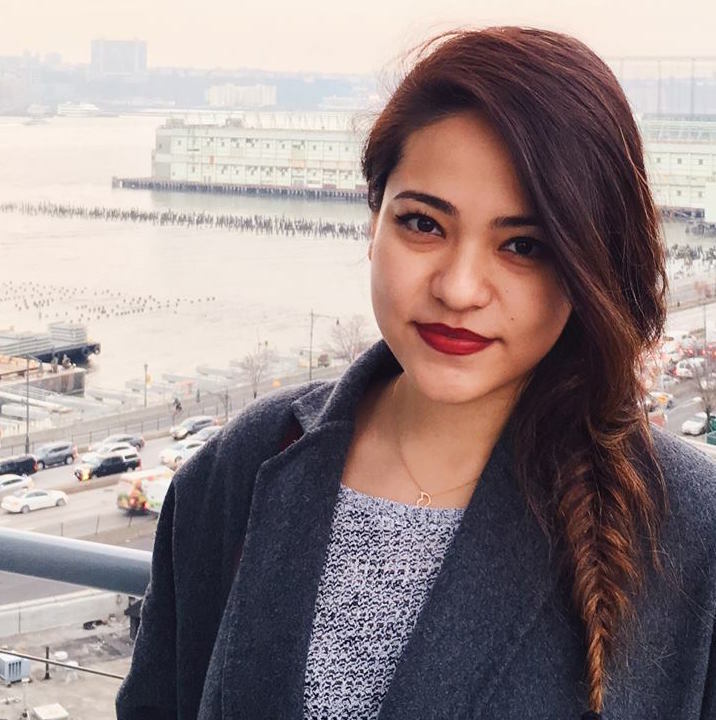 For decades, the Burmese government has refused to recognize Rohingya people — who can trace their roots in Myanmar back centuries — as citizens and severely limits their movements and economic opportunities. 12) Rohingya Daily Life: A young Rohingya refugee walks back to his home at Balukhali refugee camp in Ukhia on Feb. 4, 2019.